NICHOLAS A. VENTOLA is an associate attorney at GWC, where he works in the firm’s Workers’ Compensation department. Nicholas graduated from the University of South Florida with a bachelor’s degree in Political Science. He then continued his education at The John Marshall Law School, where he earned his Juris Doctorate. During his time in law school, Nicholas worked as an advocate for United States military veterans. He also interned with the Cook County State’s Attorney’s Office, studied abroad in the Czech Republic, and served as the president of the student government. 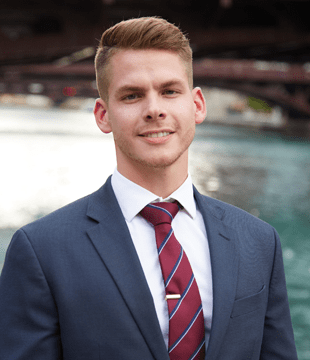 Licensed to practice law in the State of Illinois, Nicholas is an active member of the legal community and sits on the board of the Lesbian and Gay Bar Association of Chicago. When he is not practicing law, Nicholas enjoys traveling, exercising, playing the cello, and volunteering for a local chapter of his fraternity at DePaul University.